In traditional fire places, which are also referred as atmospherically vented fire places, the combustion air is pulled from the rooms and mixed with fuel to burn it in order to generate heat. This is also called combustion air zone (CAZ). After the combustion, the exhaust gases are expelled through the flue. In present buildings equipped with powerful HVACs any chances of air leakage to outside are an absolute no-no. They have become so airtight that atmospherically vented units suffer a serious lack of air for combustion. According to the rule of science every cubic foot of air that enters the furnace is replaced by another cubic foot of air that comes into the hours from outside. This increases air infiltration into house. In such condition if the house is absolutely air tight, the atmospherically-vented furnaces cannot perform at their peak efficiency. It also causes a major problem called back-drafting. After the combustion process is over, the exhaust gases are removed through the flue. The heat of the flue gases creates a negative pressure inside the chimney, pulling them out of the home. The pressure inside the room goes down due to airtightness. As a result the exhaust vapor instead of going out of the chimney, comes down, and mixes with inside air. The combustion gases contains CO (Carbon Monoxide) and CO2 (Carbon dioxide); Lon exposer to these can be risky. An appropriate solution has been found to this problem in form of sealed combustion units. These units are completely sealed from the interior environment of the house. They have two pipes that connected to the exteriors. On bring in outside air for combustion and the other takes out the exhaust gases. These two pipes are usually combined as a single concentric pipe. •	It prevents vapor from affecting furnace parts. Vapor mixes with room air often corrodes the parts of the furnace. 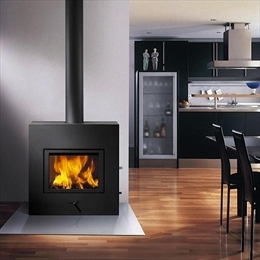 •	Reduces the danger of backdrafts (pulling exhaust gases down the chimney). •	They have an AFUE of 90 % and above. •	You don’t need chimneys to exhaust gases out. As they gases are relatively cooler, plastic pipes can be used to vent them.